This is sad but true - there are a million things to buy/ make for little girls out there, but not so many at all for the little guys. 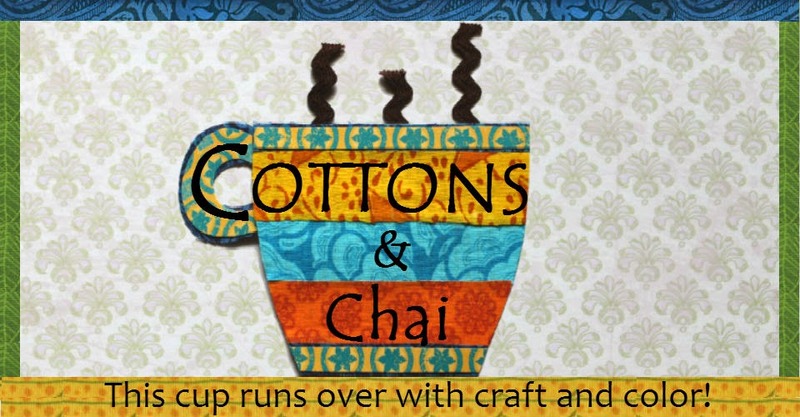 When the time came to make something for my friend's son for his birthday, I scratched my head and scoured the internet (not simultaneously) for some appropriate project, but nothing really caught my eye. I decided to address this glaring lack of sewable-especially-for-boys projects by creating my own pattern. I thought of what could be most suitable for a boy and came up with - surprise! - a car. Ever since my son was born, I used to think I'd try as much as possible to steer clear of gender stereotypes and let him play with whatever caught his fancy, including dolls, teacups and the like. But the fact is, he seems to be more interested in modes of transport. I don't know what it is, but even a set of stacking cups becomes a pretend car and 'vroom-vroomed' about the floor! 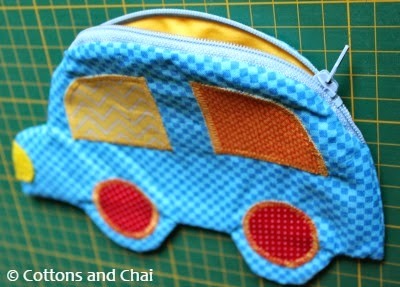 Finished Size: The finished car is approx 8" * 6"
2) Sew a zipper on a curve. After all, riding along a curve can be risky, but steer carefully and you'll soon be home safe! This is so cute! Can I suggest you something to make it more cute? :-) It may not seem practical but I thought I'll let you decide. If there were little faces of travelers that could be attached to the window with a press button - a face of a dog, a boy, girl etc. 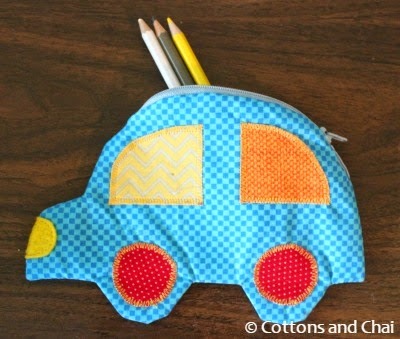 it would be fun to pretend-play who's going to school today in the pouch. A press button is strong enough to hold the traveler to the window but easy enough for little hands to take off and replace with another one. A small zipped compartment inside the pouch could hold the other faces until their turn comes to 'travel' so they don't get lost. :-) It was just a passing thought. I thought I should share.